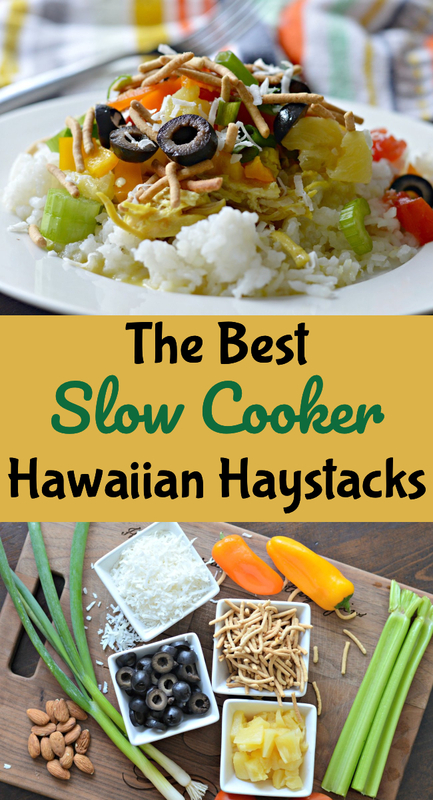 Inside: Learn how to make this delicious slow cooker Hawaiian Haystacks recipe. It is easy to make and perfect for feeding a large crowd. One of the blessings of living in a multicultural country like the United States is that you have the opportunity to try food from all over the world. 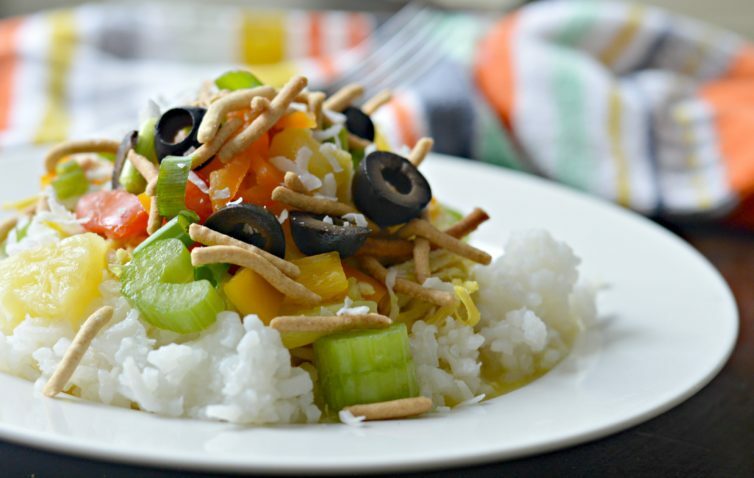 You can even combine flavors from different cultures to make your own! 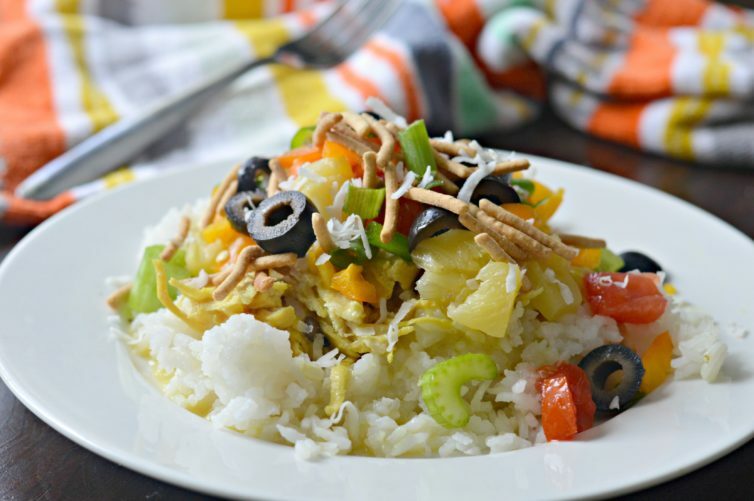 This recipe for Hawaiian Haystacks is one of my favorite meals to prepare at home because it is versatile and easily customizable. Also, the flavor profile can definitely make you feel like you are traveling to a Hawaiian paradise! The first time that I tried this dish was at a gathering with friends. We had a great time playing games and catching up, and since that time this has been one of my favorite recipes. It was years after I moved to the United States before I tried this, and now I can’t believe it took so long to have it for the first time! Feeding my family can be a challenge sometimes since everyone has different preferences. That is why I love this type of food because everyone can add the ingredients that they like which makes it easier for everyone to be happy. My favorite way of serving this is to have individual bowls with the various ingredients set up buffet-style. You then instruct everyone to serve themselves rice and top it with the chicken mixture, before adding the ingredients that they want. 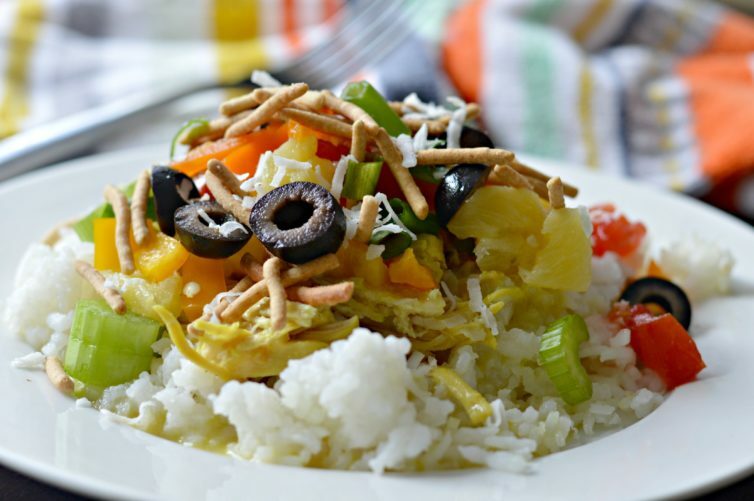 It is important to mention that this dish isn’t really from Hawaii, but it does receive its name because of some of the common ingredients like pineapples and coconut, which are common in Hawaii. 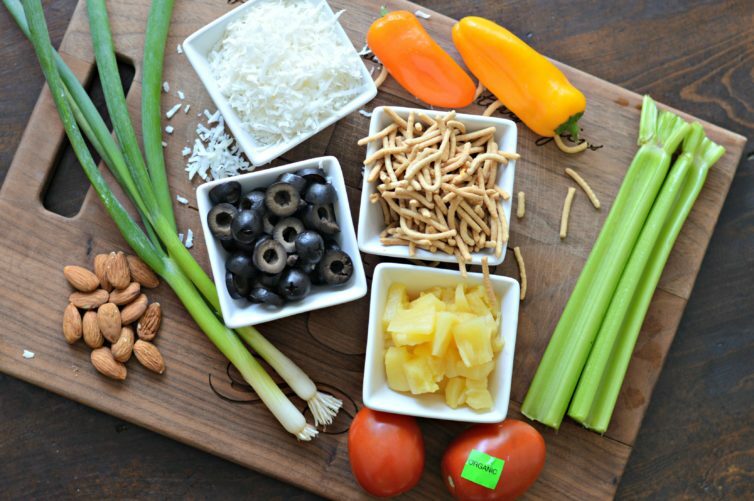 This recipe is popular all over the country, and of course, you can add other ingredients as well. The flavor combination is delicious and pretty healthy as well. The creamy chicken mixture is one of my favorite parts. It goes great over rice, but you can also eat it all by itself as well and you won’t be disappointed. You can also switch this up a bit by using shredded pork instead of chicken, but I personally prefer it with chicken. I promise that you will love this recipe after trying it and it will become a regular on your weekly meal plan. Let me know how it turns out in the comments below. 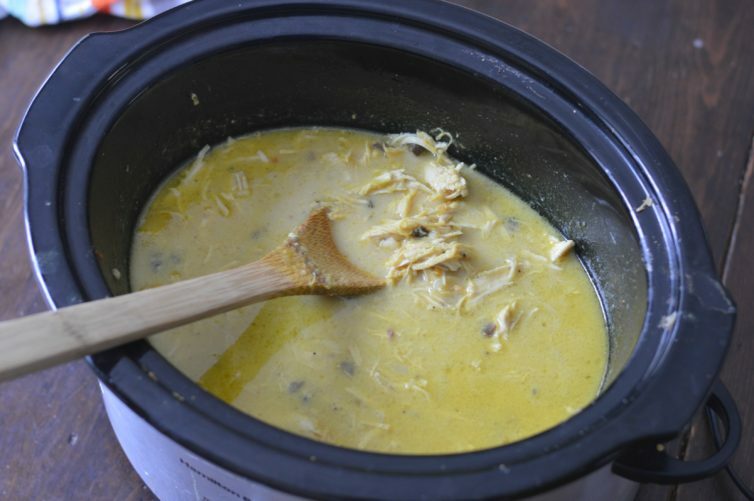 Start by adding the chicken and all of the other ingredients except for the milk and the corn starch to a slow cooker, and cook over high heat for 3 hours. Shred the chicken while still in the slow cooker with a fork, add the corn starch and milk and let it cook for one additional hour. 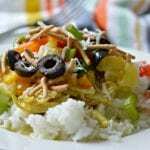 After an hour, serve over white rice and add the desired ingredients.